When injecting yourself on a regular basis, make it part of your daily routine. Put the emphasis on cleanliness to ensure safe injections. Prepare everything you will need (eg., syringe, needle, alcohol swab, drug). Wipe the injection site with the alcohol swab and let dry. Withdraw the drug using the technique you learned from your health-care professional. 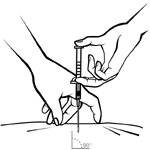 Use your index finger and thumb to stretch the skin at the injection site. Insert the needle at a 90º angle. 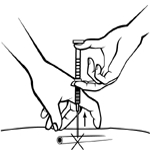 To verify that the needle is not being inserted into a vein, pull the plunger back a little; if you see blood in the syringe, pull the needle out slightly (a few millimetres). To make sure that the needle is out of the vein, gently pull the plunger. Needles and syringes should only be used once and then thrown away since they may be dirty and blunt. Always use a sharps (disposal) container to safely discard used syringes and needles. Return the container to the pharmacy when it is full or you no longer need it. Remember always to wash your hands thoroughly to reduce the risk of infection at the injection site!